The A to Z Mall Scavenger Hunt is one of 8 Mall Scavenger Hunts on the Birthday Party Ideas 4 Kids website. 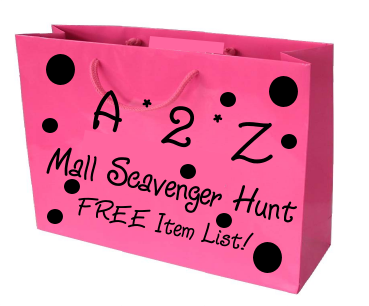 The A to Z Mall Scavenger Hunt is fun for kids, tweens and teens! The players divide into teams and search the Mall for items that begin with each letter of the alphabet. We’ve included a FREE item list with lots of fun items to find that can be printed out for the party. The scavenger hunt can be played several different ways including taking photos of the items (which means no cost!) or giving the players $20.00 per team and seeing which team can come back with the most items from the list using only the limited amount of money. Before any Mall Scavenger Hunt make sure to check with the Mall staff to see if pictures are allowed and always make sure to be courteous to shoppers and employees! And of course Birthday Party Ideas 4 Kids is the perfect place to get the party started with over 175 birthday party themes, party games and a Sleepover guide!